The boys and parents spent a chilly weekend practicing their cooking skills at Camp 175. 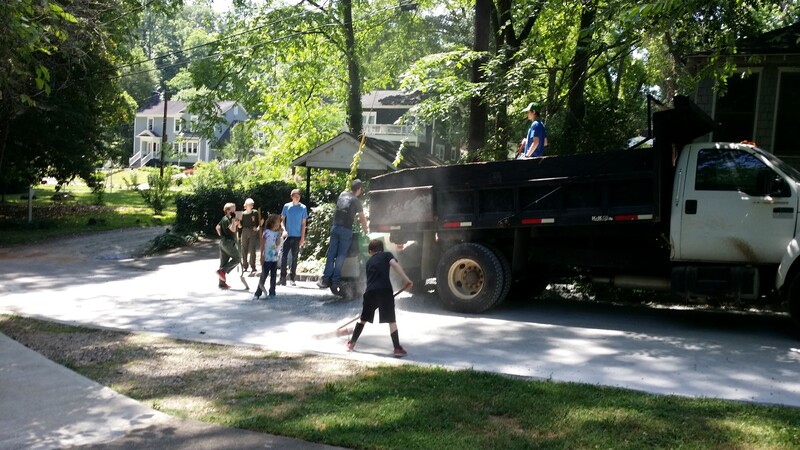 Ian’s Eagle project was to resurface a muddy, root-filled walking trail that connects two paved portions of the Decatur community bike path at Green Street. Ian used older scouts to help with advance planning and to manage the younger scouts performing the work. They spread tons of sand and gravel over the muddy path to raise it above the level of frequent flooding. The project was completed in one 4-hour workday at a cost of $1,385 funded by the beneficiary, Agnes Scott College. Ian Coleman earned his Eagle rank on August 22, 2017. Troop 175 Scout Jackson Austin-Cruse earned a spot in the August 2017 issue of Boys’ Life magazine. 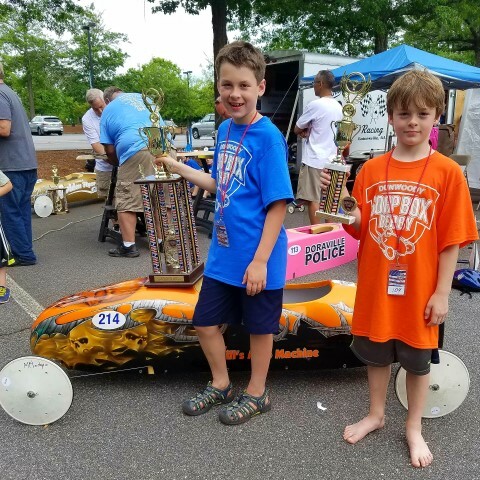 He won the Super Stock division of the 2016 Dunwoody Northeast Georgia Soap Box Derby and went on to participate in the World Championship. See page 11 of your August 2017 Boys’ Life magazine. Here are some photos of Summer Camp 2017. We built bridges, shot arrows, piloted kayaks, sailed boats, jumped off the dock, played with snakes, cooked some meals, played cards, worked with leather, practiced swimming, sank canoes and attempted to play basketball in the water with a greasy watermelon. Oh, and we also earned some merit badges along the way. Thanks to Troop Photographer Jack Henry Walker for taking hundreds of great pics! We took our first beach trip in April, 2017. Destination: St. George Island, Florida. We had a great time swimming, canoeing and kayaking. After dinner we took a night hike on the beach. Here are some photos of the 2017 Camporee at Bert Adams. The Golden Axe competition got off to a great start, but sadly, we were defeated in our attempt to retain the coveted Golden Axe award. Here are some photos of the backpacking and hiking trip from February, 2017. In January, 2017 we visited the American Heritage Infantry Museum at Ft. Benning. Every fall we do some sort of outing that’s centered around target shooting. We learn how to safely handle and fire the guns before the trip. This year we chose shotgun shooting.